Placide, a teacher at Kabilizi Primary School, gives a lesson on the food groups that make up a balanced diet. Placide learned how to teach his students the essentials of healthy cooking and strategies to develop a vegetable garden at his school through his trainings with GHI. In the poorest and most food-insecure regions of Rwanda, school meals act as a powerful incentive for kids to stay in school. Nutritious school meals not only help increase attendance but also improve academic performance and reduce dropout rates. However, without a garden to produce their own nutritious vegetables, many rural public schools do not have the means to provide food to students and teachers. 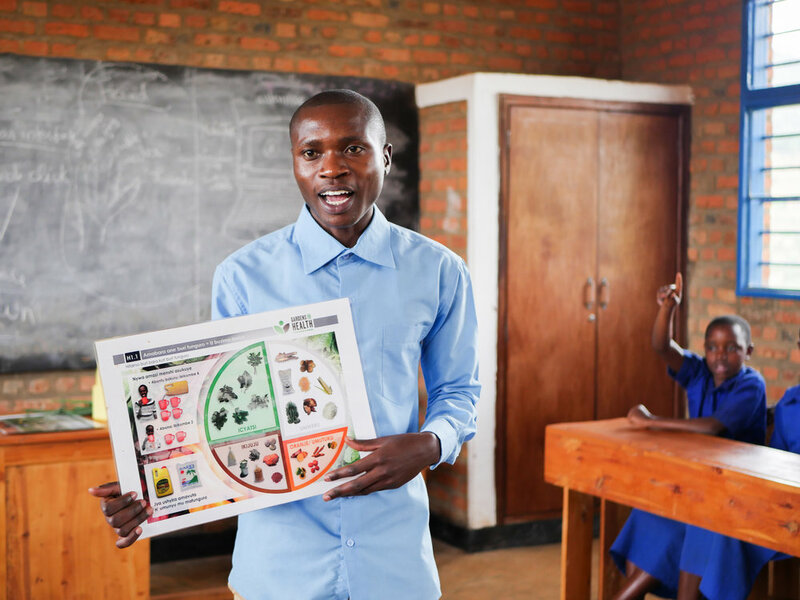 That is why in 2017 we began our partnership with the UN’s World Food Programme to train teachers like Placide in 104 primary schools across Rwanda. We train these teachers on our core nutrition curriculum and give them fruit and vegetable seeds to form gardens at their schools. In turn, the teachers educate their students on these essential lessons for good health. The students now help manage the school garden and are encouraged to implement what they have learned at home. Through this program, we’ve reached 83,000 primary school students, and we are set to renew our partnership with the World Food Programme to reach even more next year. Placide proudly shows off his school’s new vegetable garden, where fresh vegetables are starting to ripen. Placide and his students now work together to cultivate a new garden on the campus where dozens of vegetables are already ripening. “My students and I didn’t know the colors that make a balanced diet before, but GHI taught us that,” he explains, “There were many who didn’t even know the components of a balanced diet: carbohydrates, proteins, and fats. But now, we all know this.” Equipped with nutrition knowledge and their own school garden, Placide and his students are on the path to a better education and a healthier future.